Rediscover #1 New York Times-bestselling author John Green from the beginning with four critically acclaimed, award-winning modern classics, including Looking for Alaska, An Abundance of Katherines, Paper Towns, and The Fault in Our Stars. This deluxe hardcover library includes beautifully updated hardcovers of John Green’s award-winning backlist in a stunning case featuring key icons and popular quotes from all four books. 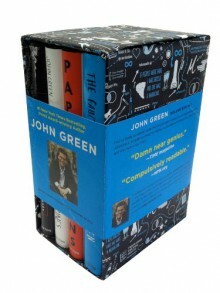 The perfect collector's item for any John Green fan in a lush, gifty package. I ordered this beautiful (but unsigned) boxed set from a TBD sale awhile back. It finally arrived today (Nov 21st) and having not read any of the John Green books before I'm quite excited to start this!